Fashion is our friend, especially when we nail a trend… So that’s what I’m here for—to bring you the current trends and offer advice on how to feel comfortable in your skin while wearing the latest and greatest! 1. Throw on a plaid poncho over a color coordinating, striped long-sleeve tee with a pair of distressed denim or regular dark wash denim and booties or boots (like in the feature photo, originally found here). This is such a cute, casual look for running errands, going on an adventure with your kids, friends, or significant other, and even visiting a pumpkin patch! The key to perfecting this outfit is to make sure your striped long-sleeve tee matches with some of the colors in your plaid poncho to pull it all together. Mixing patterns and prints is a great way to play up your outfit, but you don’t want it to look too chaotic with clashing colors! 2. For a classy holiday look, throw on a gray (or any light neutral) poncho over a light neutral turtleneck with white jeans. Add a red lip and red nails, and you’ve got a crisp, eye-catching outfit for Thanksgiving and Christmas time! 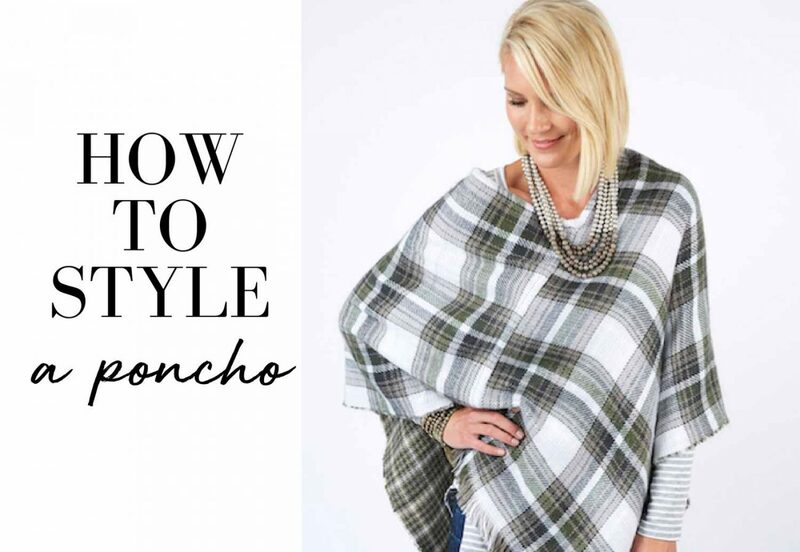 Like anything, the key to this trend is finding the poncho and outfit combination that you feel most comfortable in. Try one of the examples found above, but don’t feel limited by them!